This Easy 5 Minute Lunch is perfect for a busy day. Pair a jazzed up grilled cheese with a cup of soup for an easy, filling meal. This post is sponsored by the General Mills Bell Institute of Health and Nutrition on behalf of ProgressoTM and ReganMillerJones, Inc. I received free samples of the soup mentioned and was compensated for my time. Just popping in to share a quick little lunch idea I’ve been loving lately. For some reason, the idea of a soup and sandwich combo is something I typically only choose at restaurants. It never seems to come to mind when I’m thinking about lunch at home…until lately! When I was asked to check out some ProgressoTM soups, I jumped at the chance! The weather was cold and I was definitely in need of some quick lunch options. I was also excited to hear that ProgressoTM is now serving White Meat Chicken With No Antibiotics. Ever! They have a variety of chicken soups made with 100% antibiotic and hormone free white meat chicken breasts…because quality is always in season! As you guys know, when my toddler decides he wants to eat, that means he wants to eat immediately. 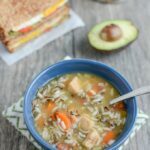 He’s recently become pretty good at using a spoon, so I’m excited to be able to start stocking my pantry with these soups for a quick, easy and convenient lunch option. 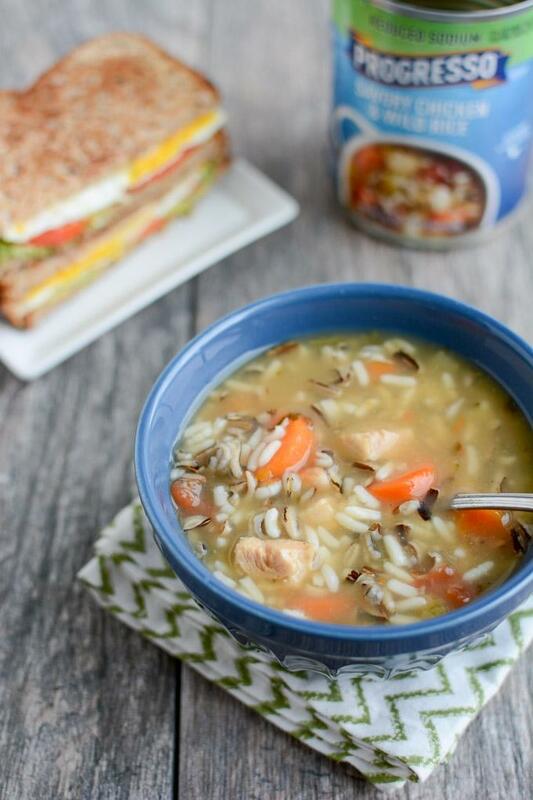 Squish and I enjoyed the Savory Chicken and Wild Rice Soup for lunch a couple weeks ago. I loved that it was a reduced-sodium variety and he loved fishing the chicken and carrots out of his bowl with his spoon. To make it a complete meal, I whipped up a few sandwiches to go with it. We all know grilled cheese pairs perfectly with soup. 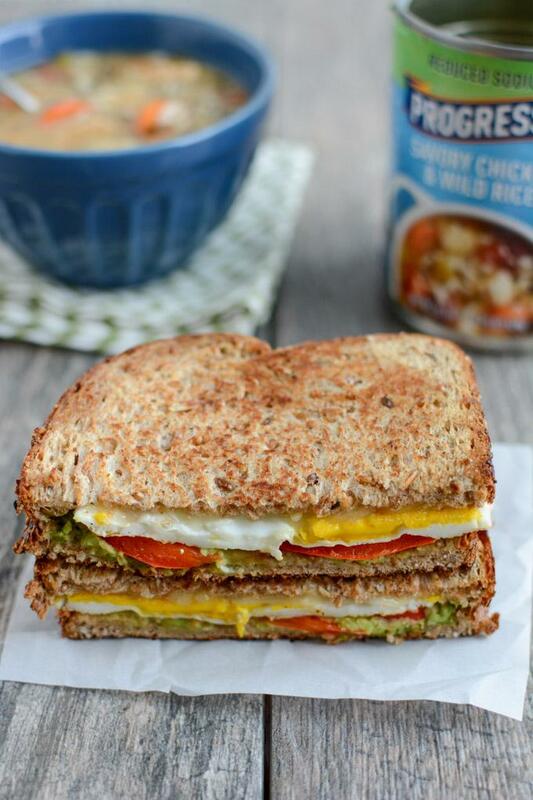 To jazz things up a little bit, I added a fried egg and some avocado and red peppers to our sandwiches. Add a little butter to a pan. Fry eggs, flipping once and cooking until yolk reaches desired degree of doneness. While eggs are cooking, mash avocado and spread on the inside of two slices of bread. Top with red pepper slices. Add a fried egg to each one, top with a slice of cheese and another slice of bread. Place sandwiches in pan and heat, flipping once, until cheese is melted. Give it a try for lunch this week! And follow ProgressoTM on Pinterest, Instagram and Facebook for more great recipes. Yes! 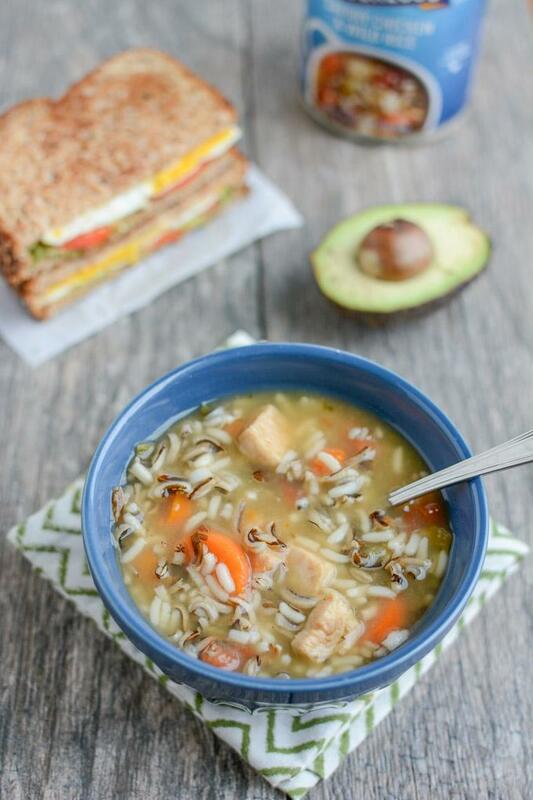 I love quick lunch ideas! Because ain’t nobody have an hour to make lunch.